서명/저자 Retirement, work and pensions in ageing Korea/ ed. by Jae-jin Yang; Thomas R. Klassen. 발행사항 London: Routledge , 2010. Even among the four Asian tigers, with their economic miracles during the past several decades that allowed them to join the ranks of the developed nations, South Korea is extraordinary. As significant as its economic progress, from a dirt poor and devastated nation in the 1960s, is South Korea "s emerging welfare state. Although established in a short time, and still immature in some aspects, its unique East-Asian model now faces a population that is aging at an unprecedented rate. This book introduces readers to the impact of demographic changes in Korea, particularly the impact of these on work, retirement and pensions; and as importantly, provides an explanation for the reforms of public policy in these domains. 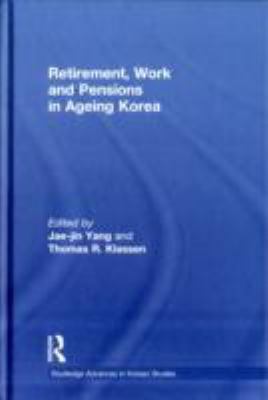 The chapters provide an up-to-date assessment of aging, retirement, and pension policies in South Korea and give valuable insights into the diverse aspects of the unprecedented rapid aging. The theme of this volume, which brings together the foremost Korean scholars and experts, is how rapid demographic change in Korea has been a central factor in income security policy for the elderly, as well as workplace policies.